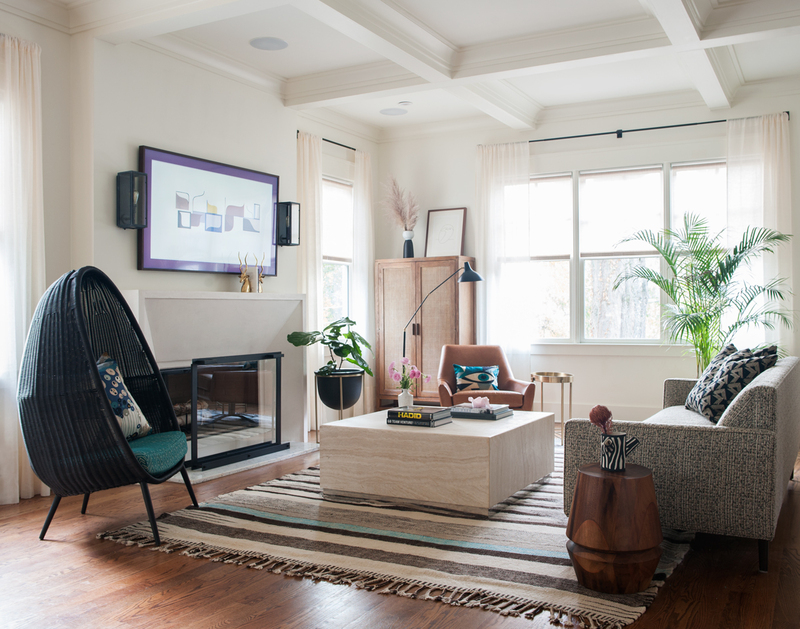 “I loved pink before pink was cool,” says homeowner Heidi Woessner, a neurologist at Piedmont Hospital, who wanted a feminine home office. Interior designer Kate Hayes ordered the custom Moroccan-style doors from a company called Pinecrest, then had them painted with a lacquered finish. The walls are wrapped in a Zoffany pattern that resembles agate. The brass desk is from CB2. When Heidi Woessner and her husband, Jason Williams, bought the Westside lot, it was just a sloping plot of weeds with a cinderblock house. But the Howell Station neighborhood, sandwiched between the West Midtown shops and restaurants and the future Westside Park at Bellwood Quarry (which will become the city’s largest park), has become a hot intown haven. The couple was able to buy the land slated for two smaller houses so they could build one custom home with a yard for their three dogs. A Jonathan Adler chandelier brings the right amount of glam to the breakfast room. The living room mixes midcentury and contemporary elements with its understated custom mantel, a coffered ceiling, pillow fabrics by Miles Redd for Schumacher, and a travertine coffee table from Williams Sonoma Home. The art over the mantel is trompe l’oeil; it’s a Samsung television with changeable screensavers and a walnut frame. All along, they wanted something that looked historic, where nobody could quite tell what year it had been built, says Jason. The Craftsman exterior is a nod to timeless design, and inside, they continued the classic look with 10-foot ceilings, substantial trim work, a Dutch door, and old-fashioned joinery techniques. 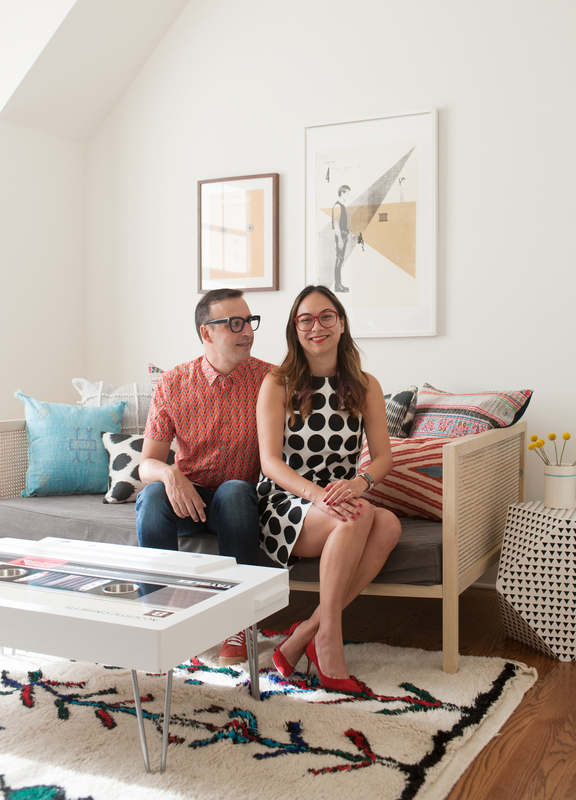 Working off a plan by architect Bonnie Henry, the couple enlisted interior designer Kate Hayes to assist with every step. 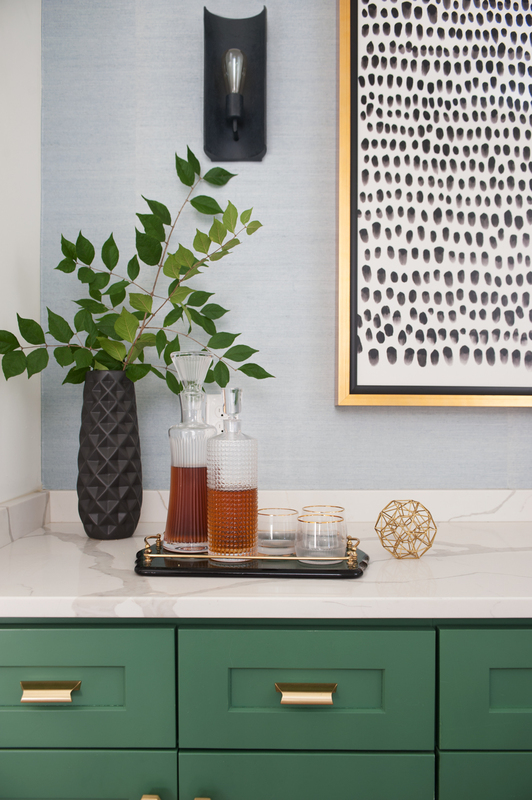 Kate chose Benjamin Moore “Webster Green” for the cabinetry and a pale blue backsplash —Ogee Drop from Fireclay Tile—for optimum effect. The custom hood and barstools are by Hancock Surface Studio and Kendrick Anderson; the appliances are Sub-Zero and Wolf. The kitchen’s green hues are carried into a festive bar area off the foyer. Brass hardware is by Schoolhouse. “I had a pretty good Pinterest page to start with,” admits Heidi, “but I didn’t want a house that looked like anyone else’s. I wanted to be prodded.” Kate did just that, coaxing Heidi into a dreamy kitchen bathed in shades of saturated green, with a backsplash of handmade Moroccan-style tile. A groovy agate wallpaper and custom pink doors to Heidi’s office are other unique touches. “We definitely went a little edgy,” says Kate, confirming that this house is all about taking risks. The master bath feels current, but elements like a clawfoot tub and basketweave tile floors look at home in a historic neighborhood. 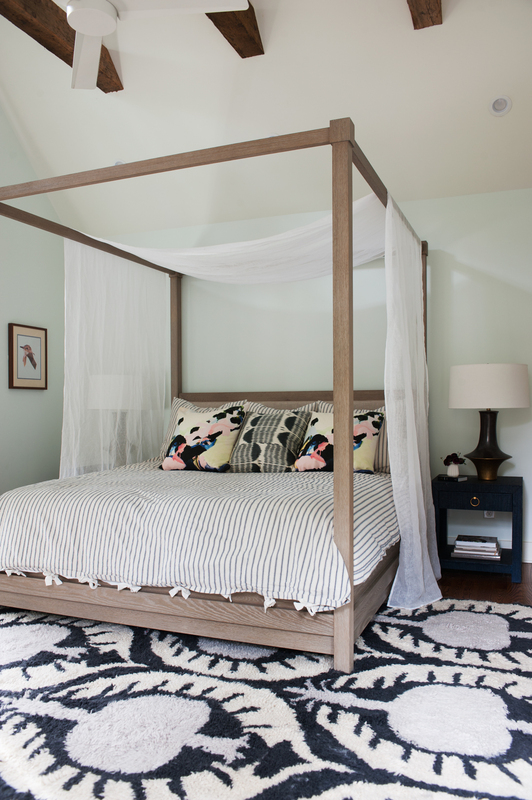 A Restoration Hardware poster bed fills the vaulted master bedroom. 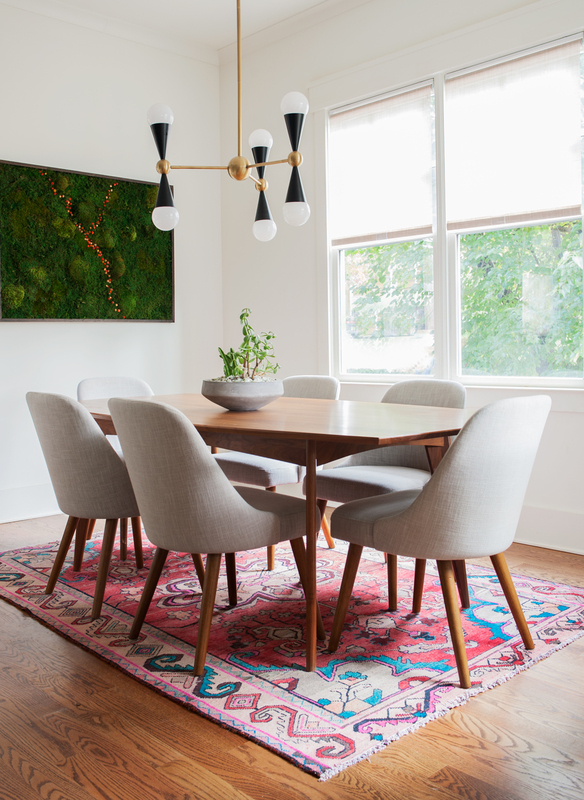 Tables are from Serena & Lily and rug is West Elm. Office Wallpaper: Zoffany, Grizell & Mann, grizzelandmann.com. Desk and chandelier: CB2, cb2.com. Pillows: Slightly East, slightlyeast.com. Chair: Restoration Hardware, 3030 Peachtree Road, restorationhardware.com. Doors: Pinecrest, pinecrestinc.com. Paint on doors: Benjamin Moore “Rosetta,” benjaminmoore.com. Kitchen Cabinet hardware: Schoolhouse, schoolhouse.com. 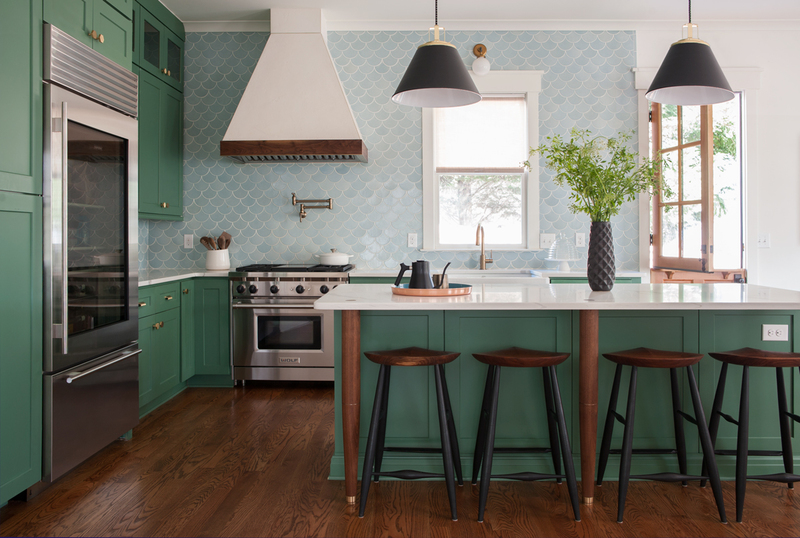 Cabinet color: Benjamin Moore “Webster Green.” Pendants: Rejuvenation, Ponce City Market, rejuvenation.com. Backsplash tile: Fireclay Tile, fireclaytile.com. Custom hood and barstools: Ryan Hancock, stools in collaboration with Kendrick Anderson, hancocksurfacestudio.com. Appliances: Sub-Zero and Wolf, 3280 Peachtree Road, subzero-wolf.com. Living room Sofa: Room & Board, Westside Provisions District, roomandboard.com. Black wicker chair: Pottery Barn, multiple locations, potterybarn.com. Coffee table: Williams Sonoma, multiple locations, williams-sonoma.com. Floor lamp: Circa Lighting, Aerin collection, 3078 Roswell Road, circalighting.com. Pillow fabrics: Miles Redd for Schumacher, ADAC, fschumacher.com. Master bedroom Bed: Restoration Hardware. End tables and dresser: Serena & Lily, Westside Provisions District, serenaandlily.com. Lamps: Arteriors, arteriorshome.com. Rug: West Elm, multiple locations, westelm.com.